Missions → WHY NOT WOMEN? Millions of women all over the world are looking over the church's shoulder, longing to see the freedom Jesus purchased for them at Calvary. Millions more have found freedom in Jesus but are still bound by human ideas - ideas that pressure a woman to let culture, not God, determine her place in the Kingdom. While hurting men and women outside the church cry out, "Is there any hope? Does anyone care?" their sisters in the church are asking, "How can I share the hope I have? How can I, a woman, serve the Lord?" Many women, having heard God call them into public roles in the Kingdom, are serving in positions of leadership. They are asking, "Will the church support us?" We must respond. The issue of women in missions, ministry, and leadership is dividing homes, churches, communities, even societies. We must respond responsibly, for we never want to find ourselves working against God's purposes, quenching His Spirit at work in the lives of those He has called. We must respond carefully, since God's truth often stands in direct opposition to what the majority of people believe. A hard-hitting revelation of what's at stake for women, men, the Body of Christ, God's Kingdom, and the unreached. Why Not Women? also includes an examination of the fruit of women in public ministry, an exploration of the value and roles of women in Greek and Roman history and literature, Jewish rabbinic literature, the early church, current cultures and the church today. Enjoy historical as well as current global perspectives, and a detailed study of women in Old Testament writings, Jesus' ministry, and Paul's letters. 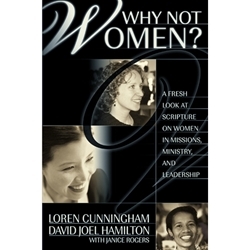 I was not only impressed with the handling of the question of women in ministry, but I was floored by the insight given concerning men and their roles. It is refreshing to see this issue handled so fairly, without belittling anyone.